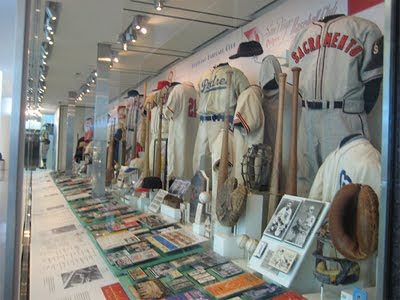 The San Francisco Airport Museum, located (as one might expect) within San Francisco International Airport, currently has an exhibit devoted to the Pacific Coast League's glory era. The display is amazing - programs, pennants, trophies, player memorabilia and equipment from the League's eight primary franchises: the Hollywood Stars, Los Angeles Angels, Oakland Oaks, Portland Beavers, San Diego Padres, San Francisco Seals, Sacramento Solons and Seattle Rainiers in all their glory. I particularly like the uniforms. Great photos here. It's my dream to help create an exhibit like this devoted to the Brews. With the possible exception of the location - not that I don't like Mitchell Field. 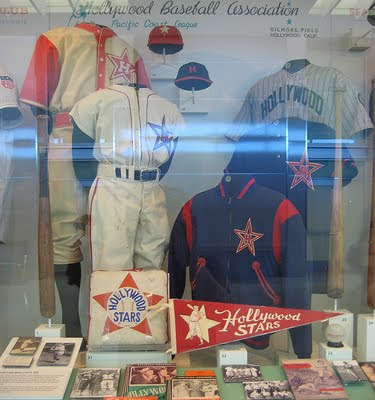 Pacific Coast League: the West Coast’s Major League 1903-1957 is on view in the International Terminal Main Hall through October 30, 2009. I'm tempted to buy a ticket through SFO just to see it. Great Photos and it is my dream also that sometime in the near future, in Wisconsin, we can do the same for the Milwaukee Brewers. Great - let's get it done.